Northfield Town Chairman Richard Erickson stands on the spot where his town ran out of money during a repaving project two years ago. From there, Northfield ground up the rest of the old pavement and covered it with gravel. There's a road in the western Wisconsin town of Northfield that used to be completely covered in pavement, but in the last few years, a lot has changed. "This is where we ran out of money two years ago," said Richard Erickson, standing on a line that divides paved road from gravel. Erickson has been Northfield’s town chairman for more than three decades. Two years ago, the community of about 600 in Jackson County repaired the intersection where this road starts. Northfield ordered new blacktop and told the road builders to keep paving until they ran out of material. It only lasted them two-tenths of a mile. That left the rest of the road still covered in potholes. Instead of leaving it that way, Northfield ground up the old pavement, and covered it in 5 inches of gravel. Erickson said they've turned 12 miles of pavement back to gravel since 2010. "You're not forced directly to go to it, but you end up doing it," Erickson said. "We have to try and keep the roads somewhat smooth so people can drive on them, and when the funds are short, it's just the best thing we could do." Local leaders like Erickson say Wisconsin state government has put them in a bind when it comes to paying for roads. 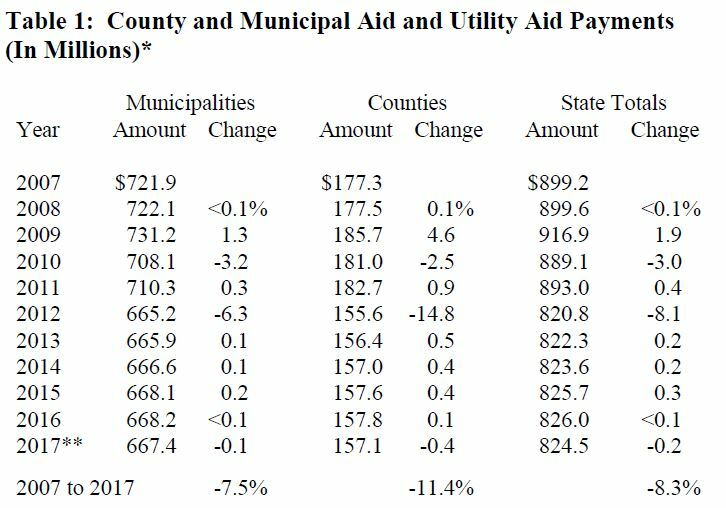 State funding for local governments in the form of municipal aid has been cut over the last decade, while local transportation funding has remained roughly flat. The state has also limited how much towns can raise from local property taxpayers, and those limits grew stricter under Republican Gov. Scott Walker. 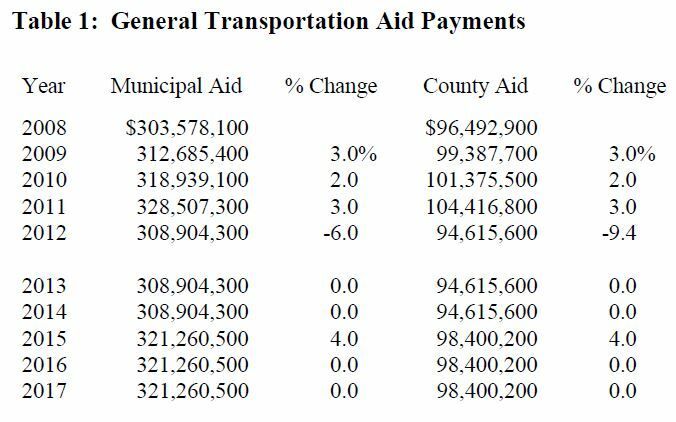 Walker has proposed increasing local transportation aid by 8.5 percent in the next budget. While that would be the largest increase in the past decade, the Wisconsin Towns Association said it would translate to roughly $10,000 for the average town, enough for road maintenance but not much else. That means even if the funding is approved by the state Legislature, it will be hard for towns to undo trends that are years in the making. In the Town of Garfield, which is just up the road from Northfield in Jackson County, longtime Town Chairman Steve Dickinsen said the situation today is much different than in the 1990s when his town was busy paving new roads. "We were so optimistic in the early '90s," Dickinsen said. "It was just fun to be here. Folks would come in here and they were just smiles and they were like, 'Yeah, my road will be next.' We had this plan and, it just … it ended." Dickinsen said Garfield had to temporarily turn a mile of blacktop into gravel, but they were able to repave it. The repaving project was paid for by a grant, not from the state of Wisconsin, but from the Ho Chunk Nation. While it’s unclear how many towns have turned old blacktop back to gravel, Wisconsin’s worsening road conditions are well-documented. A recent state audit found about 14 percent of local paved roads in Jackson County — home to Northfield and Garfield — were in poor or very poor condition. In Douglas County — where Lakeside is located — that figure jumped to about 23 percent. "So (towns) have a choice," said Wisconsin Towns Association director Mike Koles. "Do we take it from what we have now, that is a safety hazard, and turn it into gravel, which is not a safety hazard? Or do we borrow money to try to fix it the right way?" That’s the situation in Northfield, the town that has turned 12 miles of pavement to gravel. Town Chairman Richard Erickson is hoping to reverse that trend this year. He wants to turn about a mile of gravel road back into pavement. Erickson said there are good reasons to do it now instead of later. Oil costs are relatively low, which means the town can save money on materials. Also, the 5 inches of gravel road Northfield just laid down is still in good shape and would make a good base for pavement. Assuming Northfield avoids the unexpected — a costly repair to its 1970s-era road grader, for example — this might be the year to start paving again. But it would come with a tradeoff. "We have to borrow money," Erickson said. "To pave a mile of road it's going to cost $60,000 to $80,000, and our budget is just over $100,000. If you pave 1 mile of road, you've spent just about your whole year's budget. So we just have to borrow." Northfield can get a good interest rate through a state trust fund loan. Even so, not every town chair will be willing to borrow. It's a local issue at its core, but with nearly 62,000 miles of Wisconsin's roads maintained by towns, it has statewide implications. This story is part of a WPR series on transportation funding that explores how we got here and what happens next. Read part one, part two and part three.